"Sisley" redirects here. For other uses, see Sisley (disambiguation). 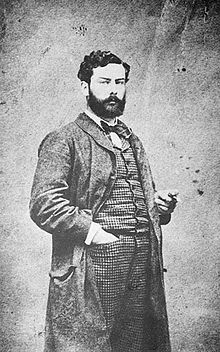 Alfred Sisley (/ˈsɪsli/; French: [sislɛ]; 30 October 1839 – 29 January 1899) was an Impressionist landscape painter who was born and spent most of his life in France, but retained British citizenship. He was the most consistent of the Impressionists in his dedication to painting landscape en plein air (i.e., outdoors). He deviated into figure painting only rarely and, unlike Renoir and Pissarro, found that Impressionism fulfilled his artistic needs. Among his important works are a series of paintings of the River Thames, mostly around Hampton Court, executed in 1874, and landscapes depicting places in or near Moret-sur-Loing. 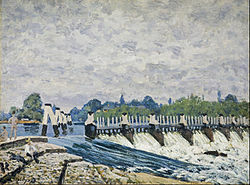 The notable paintings of the Seine and its bridges in the former suburbs of Paris are like many of his landscapes, characterized by tranquillity, in pale shades of green, pink, purple, dusty blue and cream. Over the years Sisley's power of expression and colour intensity increased. Sisley was born in Paris to affluent British parents. His father, William Sisley, was in the silk business, and his mother, Felicia Sell, was a cultivated music connoisseur. In 1857, at the age of 18, Sisley was sent to London to study for a career in business, but he abandoned it after four years and returned to Paris in 1861. From 1862, he studied at the Paris École des Beaux-Arts within the atelier of Swiss artist Marc-Charles-Gabriel Gleyre, where he became acquainted with Frédéric Bazille, Claude Monet and Pierre-Auguste Renoir. Together they would paint landscapes en plein air rather than in the studio, in order to capture the transient effects of sunlight realistically. This approach, innovative at the time, resulted in paintings more colourful and more broadly painted than the public was accustomed to seeing. Consequently, Sisley and his friends initially had few opportunities to exhibit or sell their work. Their works were usually rejected by the jury of the most important art exhibition in France, the annual Salon. During the 1860s, though, Sisley was in a better financial position than some of his fellow artists, as he received an allowance from his father. In 1866, Sisley began a relationship with Eugénie Lesouezec (1834–1898; also known as Marie Lescouezec), a Breton living in Paris. The couple had two children: son Pierre (born 1867) and daughter Jeanne (1869). At the time, Sisley lived not far from Avenue de Clichy and the Café Guerbois, the gathering-place of many Parisian painters. In 1868, his paintings were accepted at the Salon, but the exhibition did not bring him financial or critical success; nor did subsequent exhibitions. In 1870, the Franco-Prussian War began; as a result, Sisley's father's business failed, and the painter's sole means of support became the sale of his works. For the remainder of his life he would live in poverty, as his paintings did not rise significantly in monetary value until after his death. Occasionally, however, Sisley would be backed by patrons, and this allowed him, among other things, to make a few brief trips to Britain. The first of these occurred in 1874, after the first independent Impressionist exhibition. The result of a few months spent near London was a series of nearly twenty paintings of the Upper Thames near Molesey, which was later described by art historian Kenneth Clark as "a perfect moment of Impressionism." Until 1880, Sisley lived and worked in the country west of Paris; then he and his family moved to a small village near Moret-sur-Loing, close to the forest of Fontainebleau, where the painters of the Barbizon school had worked earlier in the century. Here, as art historian Anne Poulet has said, "the gentle landscapes with their constantly changing atmosphere were perfectly attuned to his talents. Unlike Monet, he never sought the drama of the rampaging ocean or the brilliantly colored scenery of the Côte d'Azur." In 1881, Sisley made a second brief voyage to Great Britain. In 1897, Sisley and his partner visited Britain again, and were finally married in Wales at Cardiff Register Office on 5 August. They stayed at Penarth, where Sisley painted at least six oils of the sea and the cliffs. In mid-August they moved to the Osborne Hotel at Langland Bay on the Gower Peninsula, where he produced at least eleven oil paintings in and around Langland Bay and Rotherslade Bay (then called Lady's Cove). They returned to France in October. This was Sisley's last voyage to his ancestral homeland. The National Museum Cardiff possesses two of his oil paintings of Penarth and Langland. The following year Sisley applied for French citizenship, but was refused. A second application was made and supported by a police report, but illness intervened, and Sisley remained a British national until his death. He died on 29 January 1899 of throat cancer in Moret-sur-Loing at the age of 59, a few months after the death of his wife. His body was buried at Moret-sur-Loing Cemetery. Sisley's student works are lost. His first landscape paintings are sombre, coloured with dark browns, greens, and pale blues. They were often executed at Marly and Saint-Cloud. Little is known about Sisley's relationship with the paintings of J. M. W. Turner and John Constable, which he may have seen in London, but some have suggested that these artists may have influenced his development as an Impressionist painter, as may have Gustave Courbet and Jean-Baptiste-Camille Corot. He was inspired by the style and subject matter of previous modern painters Camille Pissarro and Edouard Manet. Among the Impressionists, Sisley has been overshadowed by Monet, whose work his resembles in style and subject matter, although Sisley's effects are more subdued. Described by art historian Robert Rosenblum as having "almost a generic character, an impersonal textbook idea of a perfect Impressionist painting", his work strongly invokes atmosphere, and his skies are always impressive. He concentrated on landscape more consistently than any other Impressionist painter. Among Sisley's best-known works are Street in Moret and Sand Heaps, both owned by the Art Institute of Chicago, and The Bridge at Moret-sur-Loing, shown at Musée d'Orsay, Paris. Allée des peupliers de Moret (The Lane of Poplars at Moret) has been stolen three times from the Musée des Beaux-Arts in Nice – once in 1978 when on loan in Marseilles (recovered a few days later in the city's sewers), again in 1998 (when the museum's curator was convicted of the theft and jailed for five years with two accomplices) and finally in August 2007 (on 4 June 2008 French police recovered it and three other stolen paintings from a van in Marseilles). A large number of fake Sisleys have been discovered. Sisley produced some 900 oil paintings, some 100 pastels and many other drawings. View of Saint-Mammès, (circa 1880). The Walters Art Museum. ^ Poulet 1979, p. 77. ^ Turner 2000, p. 401. ^ Bomford et al. 1990, p. 203. ^ Rosenblum 1989, p. 306. ^ "French National Pleads Guilty to International Stolen Art Conspiracy". earthtimes.com. 10 July 2008. Retrieved 8 August 2007. Wikimedia Commons has media related to Alfred Sisley. Wikimedia Commons has media related to Paintings by Alfred Sisley.